Hello my friends! I am so glad to be back. I have been so busy, I apologize for no new post on Wednesday, it just wasn't going to happen. I am happy you are still with me and hoping this recipe was worth the wait! Most of you know I have a hard time with umm.....casseroles. I won't say it again. I refuse to use the word. Casseroles to me imply a pot or pan of something that looks like a dogs dinner and I KNOW that is not always the case but when I was growing up, it seemed like it was! I will go to every extreme to never name a dish using that "C" word. I have a few friends who tease me about when I use the word "Bake" or something else. I get this, "So basically it is a C word". NO, it is a "bake". ROFL This, my friends....is a BAKE. Got it? 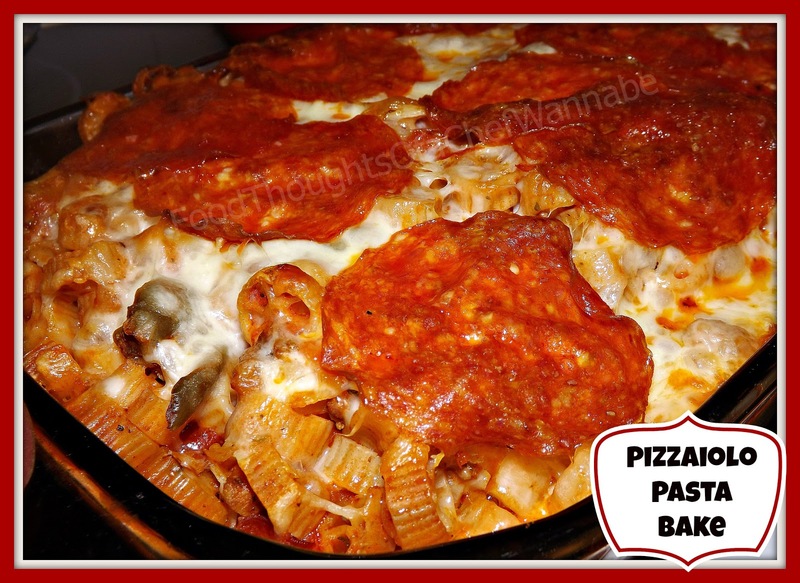 This recipe was born out of my sister telling me she wanted pizza mixed with pasta. That you can always get one or the other at a restaurant but you can't get them together. I decided to see what I could do to make her happy. I am sure she could go to the Internet and look up 5 dozen different recipes but come on, you know she wanted me write a recipe for it. After I was done I thought of the possibilities. So where I added Italian sausage and pepperoni you can add any pizza meat topping you like or just add one or the other. The are NO RULES kids!! Make it how you love your pizza. I dislike certain things so I made what I liked, but you can add whatever you want. The more veggies the better, right? I call this "Pizzaiolo Pasta Bake" because I think a pizzaiolo would tend to make a dish like this with leftover pizza toppings. Little of this and little of that. Go for it, make it your own, and warm your families from the inside out with this wonderful meal! Add 1/2 cup of any other topping you like, mushrooms, olives, anchovies, pineapple, etc. I would recommend picking just a couple, or the mixture simply won't fit into your baking dish! HA! Preheat oven to 350 degrees. Spray a 9x13 baking dish with nonstick cooking spray and set aside. Prepare pasta as directed above and drain. In the same pot add in Italian sausage, bell peppers, onions, garlic powder, and oregano. Cook until sausage is cooked through and peppers and onions are softened. When you are done, drain off any grease and add back to your pot, adding in half of your pepperoni. If you have large slices, cut them in quarters otherwise put them in whole. Mix in pasta, sauce and tomatoes, and combine. Add in 1/2 cup of mozz cheese to the pasta mixture. Pour into prepared 9x13 pan, and smooth over the top. Add remaining grated cheese and then lay the rest of the pepperoni on top. I had large slices so it covered the top, yours may or may not. It makes ZERO difference either way! Cover with foil and bake for 30 minutes. Uncover and bake another 20-30 minutes. The pepperoni on top will get a little crisp. There you have it. I found that I needed ZERO salt and pepper, you have so much flavor from the sauce and sausage and veggies, there was no need for it. This can be made ahead, it can be divided into two dinners and one can be frozen. It is a substantial.....(insert word I refuse to use) and add a salad and it is dinner! Quick and easy, for all of you working parents/grandparents or anyone! This was everything and more I thought it would be! Thanks Sissy for creating this awesome dish! Love ya! Yum! Can't wait to make it! You're so funny - and my Husband hates that "C" word too. Good tip - I'll start calling it a "Bake". LOL Looks yummy! Anyway you had me at "Pizzaiolo…"